1. Reaction To Q3 Earnings: Will Reality of Global Slowdown Again Overcome Central Bank Manipulations? We’ve just completed the third week of earnings season, after which it typically loses its influence on markets because the tone is already set and is theoretically already priced in. If however, earnings and revenues reported continue to miss forecasts at higher rates than seen in years, and markets continue to retreat on that news, we may have a the start of a change in perceptions that drives markets lower. If markets continue to sell off on bad earnings news, that would likely mean that that investors no longer believe that central bank stimulus and money printing alone can continue to drive asset prices higher while the global slowdown hits corporate performance in earnings and revenues. The coming week or two should clarify whether unlimited monetary easing has reached the end of its effectiveness. We also note in the above post that in fact the earnings picture is even gloomier than it appears when one considers that the higher rate of missed forecasts is coming despite these forecasts having been repeatedly lowered, and there are signs that Q4 earnings season could be even worse. See here for details. 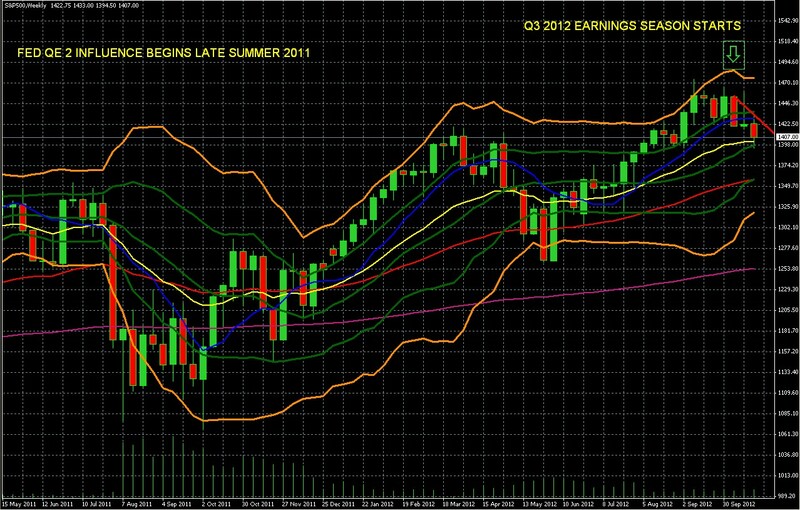 Zerohedge.com also notes here that there are signs we’ll see further downward revisions for Q4 earnings season. Finally, although earnings season is past its third week, there are still some marquee names that might influence market sentiment. See any good earnings calendar for details. Monthly US NFP, unemployment, and related reports that hint at the Friday result together form what is, taken together, potentially the most market moving group of reports for the month. Pay particular attention to the ADP version of the NFP report (Thursday), because its preparation process has been revised to more accurately predict the actual official BLS report that’s released on Friday. This purported greater accuracy could make any surprises from the ADP version more influential. The consensus for the ADP version is for ~140k new jobs, so variation of over 10% either way could be market moving. Given that this is the last jobs report before the US presidential elections on November 6th, it takes on added significance, because if it’s positive it raises the odds of an Obama re-election, and if negative, makes a Romney victory more likely. Granted, interpreting which result is more market friendly is not simple. Generally, Republicans like Romney are believed more market friendly, though some fear he’ll pull away the stimulus punch-bowl faster. While that’s better for the US in the long run because it reduces debt and the deficit, in the short run that would hurt risk assets. bond markets are flashing a warning that equity and other risk asset markets have not priced in enough risk of pullback and so remain too high (still near 2007 highs in the case of stocks). Pay attention to the spread between high-yield and investment grade bonds, which per Barclays (via zerohedge.com) are now at three year highs. In other words, bond buyers are paying more than they have since late 2009 for safety. As I mention repeatedly in The Sensible Guide To Forex, even most of those who aren’t true believers in technical analysis will readily concede its importance, simply because so most investors do use it and hence negative indicators on price charts can create their own self-fulfilling prophecy. Here are just a few technical indicators to consider. First, consider the chart below. 2. The bellwether index has dropped below and out of its Double Bollinger Band Buy Zone (bounded by the upper orange and green Bollinger Bands). This suggests a critical loss of upward momentum. See here for details. 3. The weekly chart shows that the index may be forming a bearish Head and Shoulders pattern. 4. The index is still holding above 1400, a mere 160 points below decade-plus highs around 1560, even though global growth and earnings are falling apart and virtually unlimited stimulus is already priced in. That means we’ve very limited room to climb before hitting 12 year old resistance (that’s strong) with little fundamental ‘fuel’ to power past that level. In sum, while markets could remain within their trading ranges, the longer term bias is to the downside. A number of prominent analysts have noted this. See here for details on their findings. The short answer: not good. Greece will vote this week to approve measures that the Trioka demands in exchange for more loans that Greece cannot repay. Not worry, the motions will likely be passed. Why not? Greece has little to risk given that the EU has forgiven past failures to comply in order to avoid contagion risk from a Greek default. Yes, markets may get spooked by the usual German talk about getting tough with Greece or Spain, but there’s little need to take it seriously until after the US Presidential elections of November 6th. Germany has in the past backed down anyway on fear of contagion from a Greek default. That fear, along with Washington’s request for quiet, should mean the EU remains a lesser market mover this week. However we completely agree with German Finance Minister’s warning that “the worst is yet to come.” Why not? Nothing has been solved, and the temporary solutions being used to buy time involve yet more debt and money printing, making the ultimate defaults and their collateral damage that much bigger. Meetings that typically do little besides arrive at plans to make future plans, or actually do make plans involving temporary unsustainable solutions that are variations on #1 above. Obviously that’s not a sustainable solution, though the timing of the point at which confidence in the EUR and EU collapses remains impossible. Beyond the above mentioned events, here are a few others that might be market moving. See any good economic calendar for further details. Japan: Bank of Japan monthly rate statement and press conference- suddenly significant because the BoJ just announced new stimulus and probably needs yet more, so the press conference might yield clues about when that might be coming. That in turn would move the USDJPY and USD index. As noted above, it’s not clear which candidate is really perceived by markets as more pro-market, even though Romney is obviously the more sympathetic of the two to the market participants and others who are net tax payers rather than net consumers of government cash. Those who prefer the short term benefits of QE 3, currency debasement, and minimal progress on deficit reduction are likely to see Obama as more likely to continue that along the “extend and pretend” path. So while the latest polls may influence markets, it’s not completely clear how, though we still suspect Romney is seen as the more pro-market, at least in the US. I recognize there are those who disagree and that I may catch some firm disagreement in reader comments. That’s fine with me. Longtime followers of mine know I try hard to keep these articles objective. From the perspective of those for whom it’s a priority that the US dollar retaining its purchasing power and reserve currency status over the long term, the evidence suggests Romney would be the better candidate, though it’s not clear that either candidate will have that much freedom to do what he’d prefer. For the sake of brevity, I’ll leave it at that, though I’m curious to hear what readers think on this point. ADDITIONAL FULL DISCLOSURE: IN CASE YOU WERE WONDERING, I DON’T THINK THE INTERESTS OF INVESTORS OR OTHERS WHO PAY TAXES, SAVE, OR LEND, ARE A PRIORITY FOR OBAMA. IF THERE’S A BIAS I’M TRYING TO KEEP OUT OF THE ABOVE ARTICLE, THAT’S IT.